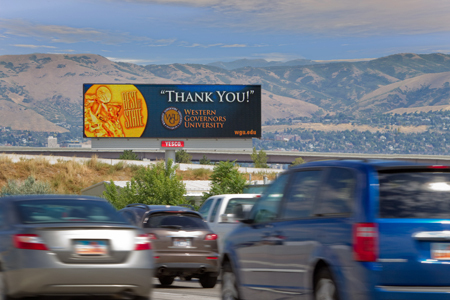 More digital signage tumult, this time on the other side of the Atlantic as Salt Lake City authorities decide to ban electronic billboards from the city’s outskirts, the DailyDOOH announces. The old idea that shiny signs distract the drivers’ attention reoccurs and this time resulted in a 9 months ban of new electronic billboards (LEDs) installed while the already existing ones (six in total) remain unaffected. In France, the outdoor media was scrutinised by the Ministry for Ecology with the aim of reducing visual pollution by regulating the surface signs, height, density,energy saving and light pollution of ads (read article about new French advertising regulations). This measure was met with great opposition by French media agencies, their frustration being replicated in Utah. This time is Young Electric Sign Company (YESCO) a long-established manufacturer of electric signs that expressed its concern for the future of DOOH- “The ban on billboards is bad for business and at a bad time for the economy. It’s a scary, scary thing.” YESCO Vice President Jeff Young said (Salt Lake Tribune). YESCO counters the negative effect argument by highlighting the helpfulness of Amber Alerts (child abduction alerts) broadcast on its billboards. The debate is open: Are outdoor e- billboards, screens and other form of electronic display a disruptive force on people’s everyday life and a city-scape polluter or a mean of providing them with information? Arguably people already have much time on hands at red lights so the digital signs make for a ”welcomed” presence that decreases the drivers’ perceived wait time. And less angry drivers could imply less accidents, so here: thank electronic signs for that! You can read some interesting comments about this matter directly from those affected by this decision, the Salt Lake City citizens themselves here. What’s worrying us is the local authorities’ tendency to refrain from supporting outdoor media while rather limiting it, without having sounder reasons than potentially distracted attention and potential visual pollution. What about better road maintenance and job creation? There’s a good old saying ”if it ain’t broken don’t fix it”. There isn’t a significant number of people complaining about the signs nor worrying statistics about billboard-caused car accidents so…why banning it? In the meanwhile YESCO became a major LED manufacturer with worldwide business and supporter of hundreds of jobs in Utah. As Senate President Michael Waddoups puts it ”I’d like to think we’d be accommodating to business” (Salt Lake Tribune). So do we. Thank You…or not really. 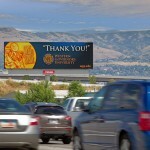 Electronic sign on US roads. This entry was posted in Hardware, Marketing and Advertising, News and tagged digital signage by Dynamax. Bookmark the permalink.